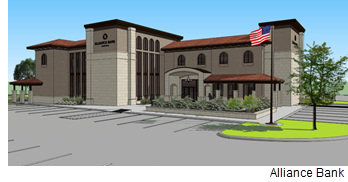 ​​​​​ WOODWAY – Alliance Central Bank of Texas plans on building a 17,000-sf full-service bank and headquarters in The Colonnade, a mixed-use development along US 84. The two-story, $4 million building will be at 191 Archway Dr. Delivery is set for December.